Covers created by Todd Ronnei during 2006 include anniversary covers and first day covers with a Churchill theme. At the urging of President Harry Truman, Winston Churchill accepted an invitation to speak at Missouri's Westminster College on March 5, 1946. As he did in the years leading up to World War II, Churchill once again spoke of dangers ahead: "A shadow has fallen upon the scenes so lately lighted by the Allied victory. Nobody knows what Soviet Russia and its Communist international organisation intends to do in the immediate future, or what are the limits, if any, to their expansive and proselytising tendencies." Then Churchill succinctly stated the European situation: "From Stettin in the Baltic to Trieste in the Adriatic, an iron curtain has descended across the Continent." Thus Churchill gave the world a stark image of the battle line in what soon became known as the Cold War. This cover marks the 60th anniversary of Churchill's speech, with Fulton, Missouri postmarks of March 5, 2006. This cover's cachet features artwork for Westminster College's anniversary celebration. The stamps on this and the above cover all relate to the event: the 1965 Churchill Memorial stamp, a Harry Truman stamp issued in his 1984 centennial year, a 1943 Four Freedoms stamp, a 1965 stamp honoring steamboat pioneer Robert Fulton (for whom the Missouri town is named), and a 1971 Missouri Statehood stamp. This cover features a Fulton pictorial postmark for the 60th anniversary, depicting Truman and Churchill riding in an open car through the town. American diplomat Charles Eustis Bohlen (1904-1974) witnessed history being made at many of the most important summit conferences of World War II. He served as interpreter for President Franklin D. Roosevelt in 1943 at the Teheran Conference, where Roosevelt, Stalin, and Churchill planned the final phase of the war against Nazi Germany, and again as both interpreter and adviser in 1945 at the Yalta Conference. Later in 1945, he also served as interpreter at the Potsdam Conference, where Stalin, Churchill, and President Truman discussed the future of Europe and cooperation in the Pacific. This first day cover of the Bohlen stamp (one of six issued to honor distinguished diplomats) features Roosevelt, Churchill and Truman stamps. The new stamp was issued at the Washington 2006 World Philatelic Exhibition on May 30, 2006. Another Bohlen FDC I serviced at the Washington 2006 show, with the show's International Day Station postmark. This cachet is by American First Day Cover Society President Chris Lazaroff. Britain's National Portrait Gallery celebrated its 150th anniversary in 2006 and Royal Mail marked the occasion with a set of ten stamps. First stamp in the set was painter Walter Richard Sickert's 1927 portrait of Churchill, which was done at Churchill's home Chartwell while Sickert instructed fellow painter Churchill in technique. Churchill, however, disliked the portrait and gave it away soon after it had been presented to him. This Churchill stamp, the first from Britain in 32 years, has a Churchill, Oxford postmark sponsored by the International Churchill Society UK, which is affiliated with the U.S.-based Churchill Centre. Here's a cover that was 41 years in the making. The new Churchill stamp added to this 1965 first day cover of the 4d Churchill memorial stamp also received the 2006 Churchill, Oxford first day postmark, creating what British collectors call a "doubled" FDC. Churchill's fourth journey to the United States in 1931 was intended to be a chance to visit some old friends and make some money lecturing to American audiences. Instead, the visit nearly became fatal when Churchill, forgetting the direction traffic flowed on American streets, stepped into Fifth Avenue on the evening of December 13. Too late he realized his mistake. Churchill later wrote, "There was one moment--I cannot measure it in time--of a world aglare, of a man aghast. I certainly thought quickly enough to achieve the idea 'I am going to be run down and probably killed.' Then came the blow." Fortunately for history, Churchill's injuries, while painful and requiring an extended convalescence, did not threaten his life. "I do not understand," Churchill wrote, "why I was not broken like an eggshell or squashed like a gooseberry . . . I certainly must be very tough or very lucky, or both." 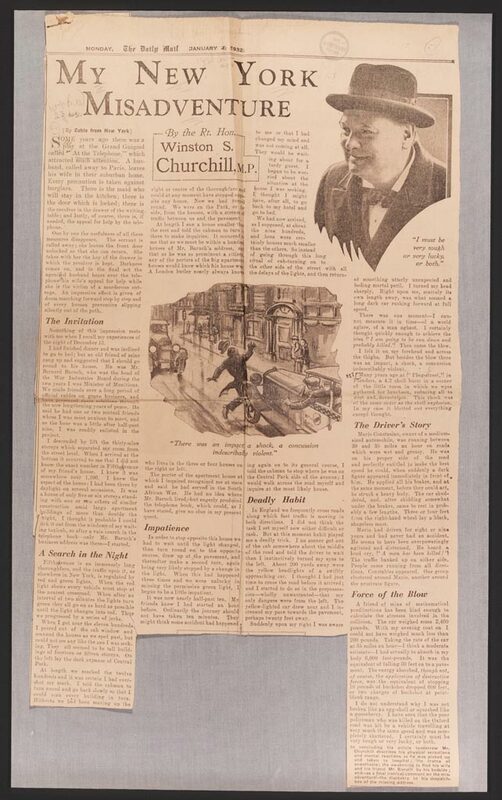 This cover marks the 75th anniversary of Churchill's unfortunate accident, which he called "My New York Misadventure." Acknowledgments: My thanks to Richard H. Knight, Jr. of Nashville, Tennessee, who supplied some of the stamps used in these covers.